I've been running a local DNS resolver for the last decade. I do that for two reasons: first of all, to bypass censorship and surveillance, and second, to profit from the essentially instantaneous answers of a local DNS cache. The latter point is becoming increasingly important in the last years, since modern websites tend to invoke links to dozens of other domains all of which have to be resolved. A satisfactory web experience thus requires, first of all, a low-latency connection to the DNS server we use. To specify “low”, let's have a look at the typical connections we have at home. With my vanilla ADSL2+, the latency to the fastest DNS servers around amounts to 8 ms for my desktop, which is connected to the router via a GB switch, or 12 ms for all devices connected via WIFI (802.11g). These values are not too bad, but not what I'd associate with “low latency”. At work, for example, we use a dedicated DNS server available in the intranet with a latency of 0.3 ms. Now we're talking. I have the same speed at home since 2009, when I started using pdnsd. Unfortunately, the development of this caching DNS proxy has stopped 2012. In addition, DNSSEC was initiated 2010 and is now an indispensable part of the modern internet. To keep up with this development, I hence needed a local recursive DNS resolver that not only caches, but also validates. The article in c't 12/2017 about the validating, recursive and caching DNS resolver Unbound thus came just in time. The setup provided by c't applied to Ubuntu, and proved to be incomplete anyway (see the comments at the end of the article). With the help of the Archwiki and Calomel, I came up with the following configuration that works as desired on Archlinux. On Debian or Fedora/CentOS, some of the initial steps may be not be necessary. # Faster UDP with multithreading (only on Linux). echo "Warning: Errors in newly downloaded root hints probably due to incomplete download:"
echo "Download of unbound root.hints failed!" curl -sS -L --compressed -o /etc/unbound/adservers.new "`https://pgl.yoyo.org/adservers/serverlist.php?hostformat=unbound&showintro=0&mimetype=plaintext <https://pgl.yoyo.org/adservers/serverlist.php?hostformat=unbound&showintro=0&mimetype=plaintext>`_"
echo "Warning: Errors in newly downloaded adserver list probably due to incomplete download:"
echo "Download of unbound adservers failed!" The adserver component is of course optional, but I've found it to be a very efficient way of blocking ads. I'll compare the various possibilities to block ads in a forthcoming post. We can test the resolver on the command line using either dig or its near drop-in replacement drill. What's essential here are the first two lines and the entries in rcode and flags: 'NOERROR' and 'ad', with the latter standing for 'Authenticated Data'. 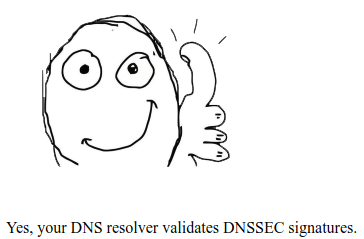 In other words, the DNS response is authentic because it was validated using DNSSEC. The RRSIG blocks provide, among other data, the public key of the domain as explained here. NOERROR, but no 'ad' flag. Quite all right. Status: SERVFAIL. Works as well. For addresses with broken/bogus DNSSEC records, such as this one, the browser should just display an ERR_NAME_NOT_RESOLVED page. It does? Excellent. Thank you, Matthäus ;) .